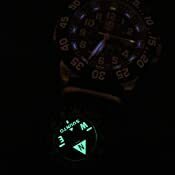 Marathon Watch CO194005BK Clip-On Wrist Compass with Glow in The Dark Bezel. Comes with a 16mm Military Nylon Strap. (Version: Northern Hemisphere) Color- Black. 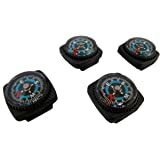 I bought them for my cub scouts as a beginner compass and they all work just fine. — Lindsay P.
Know which direction you're traveling in without having to pull a compass out of your pocket. 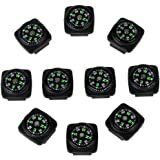 A design clipping to a strap, sleeve, or map offers hands-free operation and luminescent points, so you always have a clear sense of where you're going. Ok so here it is folks, I have put this compass in some, I guess, some tough situations. 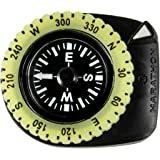 I lost the compass and dial in one of the units and wrote customer support. I was finally able to get it replaced as I had the receipt. So customer support has a hats off from me. They replaced it and I asked them about gluing the new one and they stated no do not do that. Now I have lost the second unit. Again the compass and dial. I had the watch housing for both units but you could say the guts are gone. I wear my Suunto everywhere. I build stands, cut wood, shop, church and the whole gamete. I have lost both compasses. 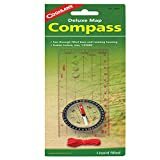 I honestly can't recommend this compass for anyone very active. I am or must be unusually rough on Suunto? I really can't recommend it to someone very active or at least not wear it until you need it. When will that be? It's not for preppers, bushcrafters or anyone else that would fall in that category in my opinion. So there it is, I am sorry!! 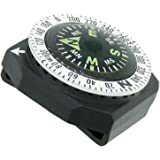 I like the appearance of the compass and it's dial but you got to be able to find it to use it! I'm an LEO in Miami and I thought this would be helpful as I'm in the area that uses names instead of numbers to identify streets. I attached it to my G-shock. At first it was great and quite helpful. 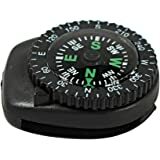 After one month of use while on duty it would start giving a bad reading (points to north one way while it would be a different direction) and then to top it off last week the actual compass fell out completely from the device it was placed inside. 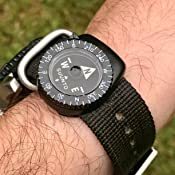 I didn't even notice until I had got back to my car and looked at my watch only to see an empty plastic bracket where the compass used to be. Being an Army vet I had grown to trust Suunto for its product reliability and ruggedness but this is simply a cheap poorly constructed tool than couldn't even hold up to average use. Very disappointed. I would have returned it but there was nothing to send back. 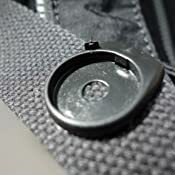 The compass fell out of its socket and got lost within a month after I clipped it to my wife's purse strap. The clip and socket remain on the purse strap. (See photo.) The compass is gone — who knows where. 1.0 out of 5 starsFailed on second day....luckily not when I actually needed it. The compass worked for one day. While showing it to someone the second day I noticed it would point most anywhere but north. I moved away from buildings, held away from my body and everything else I could think of to make it be true. I will never own one of these. You cannot trust your life with a compass that fails you. Returning it. Very pleased with this product. I have trusted this compass many times and it hasn't failed me yet. A lot more accurate then most other button compasses. Just make sure this will fit your watch band good. If not it can be extremely uncomfortable I had to modify my watch band so that it would be comfortable for me. Once I did that I never took it off! 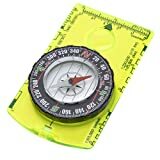 I like the compass but only give it 3 stars because it is somewhat fragile. I dropped it on my hardwood floor and the Clipper came apart in three pieces: the clipper frame, the compass, and the rotating bezel ring. Nothing broke and I was able to snap the three pieces back into place but I have lost confidence in using this product outdoors under rough conditions. The other thing I don't care for is the opening on one end of the Clipper that does not totally enclose the watchband, it could easily be pulled off of the watchband if it were to get caught on something. 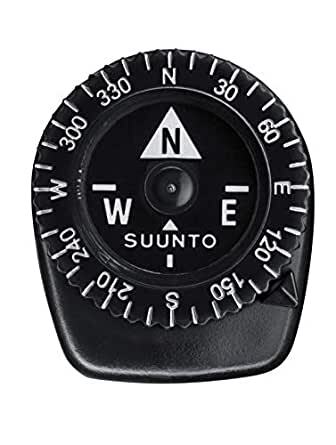 I own other Suunto compasses and they are all well made precision instruments; the Clipper is just as good but not as durable. 5.0 out of 5 starsWell made, light weight, and easy to read! Super lightweight, accurate, and fits perfectly on a heavy duty 22mm NATO strap. It also fits well on a silicone strap but needed to be fed onto the strap from the end rather than clipped on at the desired point. 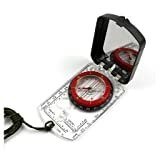 This won’t completely replace a good orienteering compass, but for general navigation and reading maps that do not require distance calculation this is an excellent addition to your gear. I use this next to a stainless steel field watch and it has no effect on the bearing. The luminescent paint charges nice and bright in daylight or via a flashlight. Well made and easy to read! 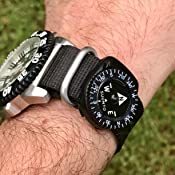 The best watch band compass. Just barely fits my 21mm nylon band. Would buy again. Updated review. Still 5 stars. I read the negative reviews before buying this but it seriously looked like the best option. It has seen heavy use in the field, when kayaking and diving. I did manage to get it to come apart several months ago. I just snapped it back together and have not had any problems since. I was heavily abusing it when it came apart but I have not been gentle with it since then. I have not had any accuracy issues either and I have checked it against my full size suunto compass as well as my milspec brunton. Mine sits next to a luminox watch that does not appear to have any magnetic influence. The one buckle on my watchman is plastic so no problem there. I actually did but another one to have as a backup. Now I would like to a decent Velcro watch band. The ones that I have used for a number of years are now being made with really cheap hook and loop. My gear gets hard daily use and my bands are only lasting 3-4 months when I used to get close to a year (same brand but cheap material). 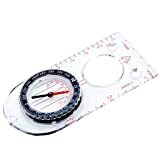 This compass may not be perfect but is the best one that I have found for this use. I really do have a collection of failures.